Spray 3 1/2-quart slow cooker with cooking spray. Place onion and pineapple in slow cooker. Spray a 12-inch skillet with cooking spray; heat over medium-high heat. Cook chicken 4 minutes, turning once, until browned. Place chicken over onion and pineapple in slow cooker. Sprinkle with salt. Pour sauce over chicken. Cover; cook on Low heat setting 5 hours or until chicken is tender. Sprinkle with onions and sesame seed. 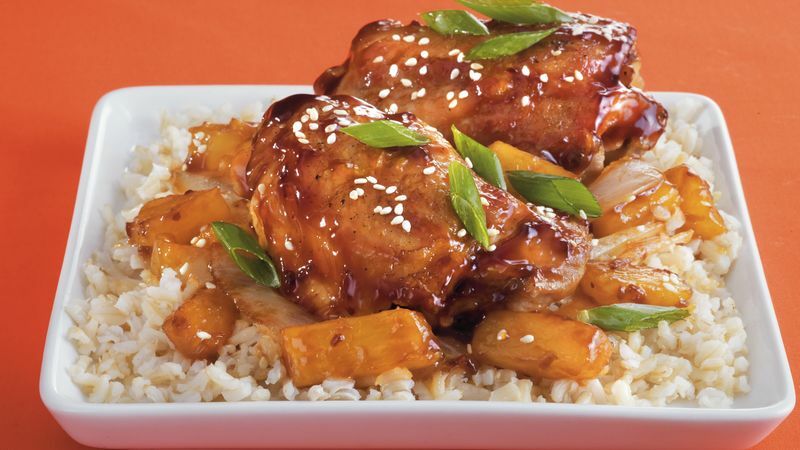 Serve this Asian-inspired chicken dish on a bed of brown or white rice. The extra sauce will taste great drizzled over the rice.